KUALA LUMPUR, 19 APRIL 2012- A number of ENT specialists trained in The National University of Malaysia (UKM) have been snatched to work abroad thereby regarded as being part of the brain drain phenomena for the country. 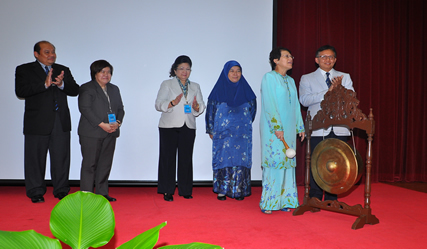 However its Vice Chancellor, Prof Tan Sri Dato’ Wira Dr Sharifah Hapsah Syed Hasan Shahabudin looked at it differently. She is of the view that these experts who chose to work abroad will one day come back home and will then bring back their expertise to the country. Opening the 4th ASEAN Academy of Neuro-Otology & Audiology Congress (AANOA) here today, she likened it as ‘brain circulation’ rather than ‘brain drain’. Neuro-Otology is a branch of clinical medicine which studies and treats neurological disorders of the ear. It is a subspecialty which stems from Ear, Nose and Throat (ENT) specialisation. She said their going abroad will allow them to gain invaluable experience and will one day bring their expertise back home. Though it does cause a shortage to the country in the immediate term the specialists nonetheless are helping people no matter where they are. What is more important is that the people should benefit regardless of boundaries, she said. Prof Sharifah Hapsah also said that new developments in ENT treatment like cochlear implants have revolutionised the treatment of hearing impairment where hearings can now be revived even in cases once considered impossible. Sign language may one day become obsolete, she said. Hearing impairment needed to be detected early as it can have a detrimental effect on an individual’s learning ability, she said. UKM began its coclear implant programme in 1995 and to date had given such implants to 295 patients. The honourary founding president of the conference, Prof Dr Suchitra Paransuk in her keynote address said she was treated with skepticism and sometimes ridiculed when she said that hearing disability can be tackled with Neuro-Ontology some 40 years ago. She had then just got back home from studying abroad. Now the Thai government is subsidising cochlear implant surgery while Neuro-Ontology is also recognised globally. Prof Suchitra said though cochlear implant surgery is accepted, the treatment depended on facilities available in a country. In some places it is only available to those who can afford it. This has to change because every child deserves the gift of hearing. UKM started its cochlear implant programme in 1995. The cochlear team also trained health personnel from other hospitals both locally and foreign. The AANOA conference which began today ends on Saturday 21 April. It also consists of various workshops on the latest technique available for ear surgery. AANOA President, Prof Dato’ Dr Lokman Saim, participants and guests from United Arab Emirates, Thailand, Australia, Singapore, Indonesia, Malaysia and the Philippines attended the conference.